Contaminants such as dirt, dust, ink lint, paper particles, adhesives and other contaminants become lodged and burnt onto the thermal print head. If the print head is not cleaned regularly the result is printing errors, bad bar code labels, streaks, smears and eventually the replacement of the expensive print head. Thermal print heads should be cleaned every time you change the ribbon, labels or card stock. Cleaning with our products will extend the life of the print head. 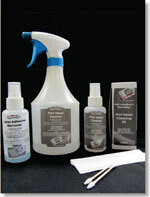 Our Adhesive Remover is completely safe, effective and easy to use. You don’t have to apply messy cleaning fluids that can splash or spill. Simply tear open the pouch and clean your equipment. Our Cleaning Products will keep your equipment in optimal condition. Our Cleaning Products are also recommended and used by the Equipment Manufacturers.